Wing Commander Anupama Joshi joined the Indian Air force in 1993, when the government opened its doors to women in the armed forces. She is from the first batch of women to join the armed forces. She served in major Air Force bases. For her dedication and hard work, she was commended by Chief of Air Staff for selfless devotion to service. She took the fight for gender discrimination in the armed forces to its conclusive end. She was instrumental in getting permanent commission for women in the armed forces. It was a seven year battle in the Delhi high court which has opened doors for women to have equal place as men in the Defence services. She is truly an inspiration! She was the founder and CEO of a financial company, Sahastradhara Khetriya Gramin Financial Service, based out of Dehradun, the mission being “To maximize the financial well-being of every individual and enterprise in rural remote parts of Uttarakhand”. The company is working in remote hills to bring financial inclusion. 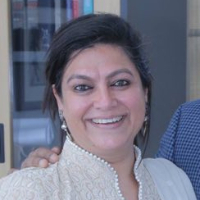 She is presently Director Personnel at The Doon School. She did her masters in Psychology, and while pursuing her MPhil from JNU, she joined the Air Force and has done her Management Development Programme from IIM (Ahmedabad). Leading a startup means building a new idea and executing it. "After leaving the Air-force I did my management development program from IIM Ahmadabad. It was at IIM Ahmadabad that I got campus placement in the firm called IFMR trust to lead a micro-finance company in Uttarakhand." Defence Administration is the management of people and assets within the Air Force. You are probably looking after an Air Force station or a unit, where you are posted. "I was one of the first women to join the Indian Air Force. I served there for 16 years. Thereafter, I became the founder and CEO of Sahastradara Khestriya Gramin Financial Services, working in rural remote hills of Uttarakand for financial inclusion. I am currently working in the Doon School as director of personnel."